I operate from home where I offer clients a bespoke treatment in a peaceful, unhurried environment, (with free parking). I am not restricted by salon hours, and can make appointments to suit, during the day, the evening or weekends. My therapy room is up a flight of stairs. I am available in Buckland St Mary, (located between Chard and Taunton) by appointment, and am generally quite flexible so as to fit in appointments. Our home, Lodge House is also a B&B (Bed and Breakfast) with 2 rooms, 1 double room with king sized bed, and one twin room. we can offer Therapeutic Breaks. Visit www.lodgehousebandbsomerset.co.uk for more details. My practice is based in Buckland St Mary, and is easily accessable from Chard, Taunton, Bishopswood, Churchinford, Wellington, Combe St Nicolas, Horton, Ilminster, Honiton, Crewkerne and surrounding areas. Reducing stress is one of the best ways of improving your quality of life and Reflexology can help with that. Due to the new Advertising Standards Authority guidelines from 1st March 2011, therapists are no longer able to claim that therapies help certain medical conditions. With ever increasing levels of stress in everyday life, it is important for people to take more responsibility for their own healthcare needs. Using complementary therapies may be one of the ways to mitigate the stresses of modern life. Everyone can benefit from a treatment, as a preventative measure to maintain good health. If you have any questions as to what would benefit you, then please contact me for advice on Complementary Therapies, including Reflexology and Aromatherapy,or a therapeutic break at our B&B in Buckland St Mary, between Chard and Taunton, Somerset. 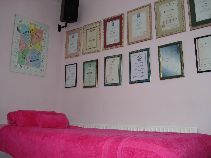 Gift vouchers are available for all treatments,and make great Birthday, Anniversary, or Christmas present. Gift vouchers are presented in an appropriate greetings card. I am also available to give talks to interested groups. I also attend pamper evenings, or Ladies Indulgence evenings, often in schools, where I offer short 15 minute Reflexology treatments.
" Dear Kathy, I just wanted to thank you very much for all the wonderful work you did on me, both emotionally (Bach Remedies) and physically (on my feet). You made such a difference - you really did - and I am truly thankful. Julie"
" Kathy, many thanks for all the wonderful Aromatherapy massages and Indian Head Massages - much appreciated. Elizabeth"
For more information or to book an appointment, please call me on 01460 234693 or email me [email protected] . Complementary Therapy, including Reflexology and Aromatherapy in Buckland St Mary, between Chard and Taunton, Somerset. Lodge House operates as a Bed and Breakfast and we also offer Therapeutic Breaks.